Welcome to Paradise Drinking Water, Southern California's premier bottled drinking water provider. We deliver the purest, best tasting and most affordable bottled drinking water right to your home or office. Our selection includes 100% natural and naturally delicious mountain fresh spring water direct from the source, the best purified water available, and alkalized Paradise P9+ water, the drinking water proven to improve your health and truly hydrate a dehydrated body. Paradise Drinking Water has received accolades for the superior quality of our water and for our excellence in customer support and service. We deliver our delicious purified, spring and alkalized bottled water to homes and offices all over Orange County and beyond. Our courteous and professional delivery people will bring your bottled water to your doorstep or wherever else you prefer; we'll even put a new bottle on the cooler for you. Paradise Drinking Water employees, both in the field and at our state of the art filtration and bottling facility, care about the quality and taste of your drinking water and your experience with us. We go beyond water purification and delivery; we offer a selection of rentable water dispensers including Watersafe coolers. Watersafe coolers work with compatible bottles featuring the Watersafe system, a valved, spill-proof cap that prevents anyone from having to touch the neck of the bottle, which can transfer germs from hands into the drinking water dispenser. Check out the rest of our website for more information on our products and services, and feel free to give us a call at any time—we're happy to help. Paradise Drinking Water now offers the healthiest and most scientifically advanced drinking water available. At Paradise Drinking Water, all of our coolers and the bottles we deliver for them feature the splash-proof, spill-proof Watersafe system. Each Watersafe bottle is fitted . 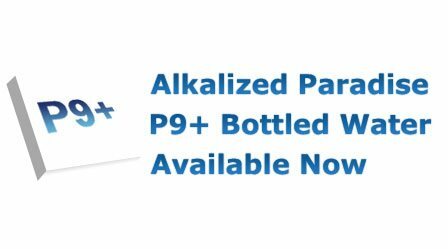 . .
Paradise Drinking Water now offers the healthiest and most scientifically advanced drinking water available. Alkalized, negatively ionized . . .